Camcorders have come a long way in the past several years, and it’s easy to find one that will record striking high definition movies in natural light, but in low-light areas it’s a different story. Not all camcorders are created equally when it comes to capturing the action indoors or in other areas with low light. If you want to make sure your new camcorder will produce the high quality results that you demand, check out these models that are best in class. One thing to look for when you know you’ll be shooting without too much light is the aperture of the lens, or f-stop. This number represents how fast the lens moves, and a faster lens can bring in more light in a short time which produces a better picture with less grainy noise. An aperture of less than f-2.8 is best for areas of limited light. Cameras achieve the lowest aperture at their widest angle, or when not zooming in too far, and the f-stop increases as you zoom in. Another thing to consider is the ISO capability, or the lens sensitivity to light. The higher the number here the better, but don’t be fooled into thinking that the highest number is the best. Even when cameras say they handle ISO 3200 or higher, the image may not be that great. Another term you might find that is more useful is lux, where this represents the minimum light required to get a good picture. For example, a camera with a minimum illumination of 5 lux will generally do better in low light than one with a minimum of 8 lux. If you’d like to keep the price tag down but want to be able to get solid results when light is not abundant, the Sony HDR-CX220/L Handycam is a good choice. It is a full high definition (1920 x 1080) camcorder capable of 8.9 megapixel still pictures in addition to video, and like many Sony cameras, it includes an excellent Carl Zeiss lens. The 29.8mm wide-angle lens will get everyone in the picture, while the 27x optical zoom allows you to get up close even when you’re in the back of the room. The HDR-CX220/L has a 2.7-inch LCD screen that is bright and crisp - even outdoors on a sunny day. What makes the HDR-CS220/L good when light is scarce is the back-illuminated Exmor R CMOS sensor. This sensor makes it possible to get really nice results without bright light while avoiding the grainy image that you might expect from a camera in this price range. The onboard SteadyShot image stabilization will help to reduce blur at the same time, maximizing your results. This camcorder has an aperture range of F1.9 - F4.0 with a standard minimum 6 lux, but it also offers a low lux setting that performs as low as 3 lux. The Panasonic HC-V720 is an upper end choice from a great manufacturer of recording devices. 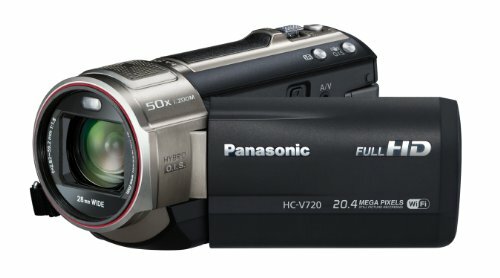 Panasonic has an entire line of really nice devices, but the HC-V720 is well suited for areas with low light. With a required minimum illumination of only 3 lux in low light mode, it will deliver a satisfying recording even when light is hard to find. There is even a 1 lux night recording mode, but this is truly for recording in the dark, not for capturing people. It also has a high-sensitivity sensor that will reduce grainy backgrounds so you can get nice results even in these challenging conditions. This camera has an aperture range from F1.8 in wide angle to F3.5 with full zoom. The HC-V720 is 3D ready and has a 28mm wide-angle lens with a 21x optical zoom to get you close to the action. It features a 3-inch LCD screen that can be used for controls and to watch movie playback. It will take excellent 20 megapixel still pictures in addition to high definition video. With the WiFi connection, this camcorder is capable of broadcasting what you are recording to your internet-connected audience in real time. You can also set the camcorder up in the back of the room and control it, as well as view the image, from your smartphone. If you’ve ever wished you could record an event without leaving your seat, this may be the answer. 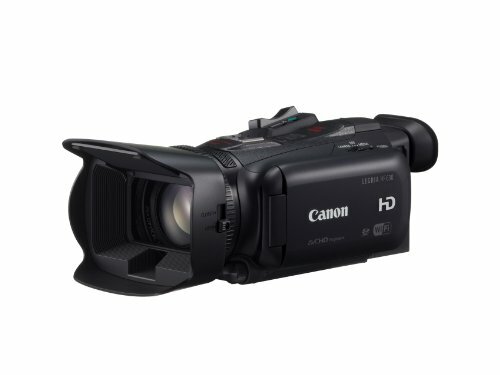 Professional Grade Camcorder for Low Light If you’re looking for one of the best available, the Canon VIXIA HF G30 is a high definition camcorder that even a pro will really like. It comes with a 20x HD lens for video and a SuperRange image stabilization that will keep things blur-free even when you use the zoom to the fullest. The camera reduces noise with a combination of a HD CMOS Pro Image Sensor and the impressive DIGIC image processor. The sensor is professional-grade, and captures more light than lower-level sensors which means you get better movies in low light. The processor aids in shooting by providing for much brighter images while eliminating noise that makes movies look grainy - even when scenes are very dark. The G30 has the other features you would expect at this price range too. The lens can go from a wide-angle 26.8mm (very wide) all the way to a 576 mm super zoom, making it extremely versatile. With built-in Wifi, you can instantly send captured video to your computer or cast it to social networks. You can also control the camera from a web browser on a portable device. The Canon G30 has an aperture range from F1.8 to F2.8, the higher number still being very low. This makes it a super performer without abundant light even when the awesome zoom is in use. It will work way down to a minimum illumination of 1.2 lux. When it comes to shooting great footage indoors or where light is at a premium, any of these fine camcorders will do very well. Also, if you have any questions, comments or concerns regarding either the article overview fo the best low light performance camcorders or about any of the models mentioned above specifically then please do not hesitate to make them in the comments section just below and we will be sure to get back to you as soon as possible.